Autumn in upon us – can you feel the change in the air? 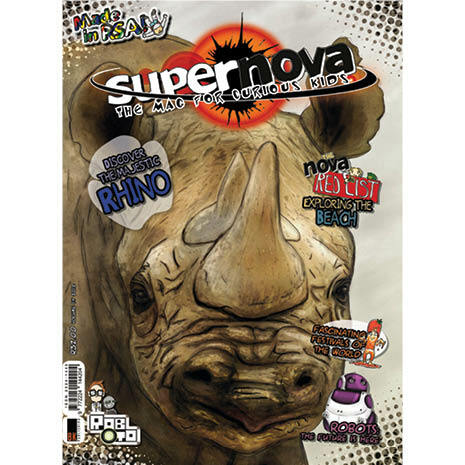 It gives you so much more reason to cuddle up on the couch and get curious with your favourite kids’ mag Supernova! If you’re not ready to let go of the summer sunshine just yet, why not explore our coast with us and check out ‘The Nova Red List’ for some tips on how to look after our beautiful beaches. You could also go bush whacking with us to discover the difference between Black and White rhinos and learn why it is so important to protect these magnificent animals. Did you know that more that more than160 rhinos have been poached since the beginning of this year? What are you doing to help before they all disappear forever? There is so much more to discover in this issue of Supernova. So whether you are cuddling up on your couch at home, or exploring the beach or the bush, keep your mind active with Supernova… Oh, and stay curious!